12" SCROLL TABLE REPLACEMENT BLADES/6 PCS. 12" long blades for the 3D Scroll Table. For use with the Pro Power Station only. 3" Short Hot Knife Tool* - The blade is made from thin tough steel with a unique round shape that slices cleanly in any direction.Cuts EPS, XPS, Blueboard, polyethylene, and polypropylene foams. *Requires Crafters Power Supply or Pro Power Station. 3D SCROLL TABLE 16" x 18"
Built for professional modelers, it is a combination Scroll Table, Router, Lathe, and Milling Machine in one versatile kit. Includes sturdy 16" x 18" indusrial strength ABS base, Fence Kit, Precision 8" cutting blades, 12" Pro Blades, Router Blades, Ribbon Blade, sturdy accessory case and 12 page instruction book. 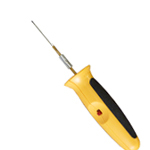 CAUTION: Hot electrial tool! Use with adult supervision! Use in well ventilated area. TWEEZERS - Save time & keep the glue off your fingers! Four tweezers: one 45-degree bent, one 90-degree bent tweezer, one 90-degree bent with hole and one straight! Click Image For More Details! A 4" blade knife that cuts, plunges, slices and dices foam with surgical precision! Requires a universal power station which is included with all Hot Wire Foam Factory Kits. Now you can replace the 3 AAA battery pack that comes with your kit and use one of our wall mount AC adapters. 4.5volt AC/DC adapter, will run up to 10 animated signs. Not recommended for non-animated signs! Six (6) 8" long blades for the 3D Scroll Table. For use with the Pro Power Station only! Converter Module -This unit will replace your battery pack. It will let you run your signs off track voltage or your power pack. Accepts an input voltage from 5 to 17 volts, AC or DC and outputs the required 4.5 volts for our signs. Will run up to 6 signs. EASY ROCK CARVING SET/3 PCS. Easy Rock Carving Tools - 3 Piece Set - Strata Tool, Carving Tool and Duster. Click image for more details. This tool was designed to cut SubTerrain's high-density foam quickly and easily. The optional Bow and Guide make the Hot Wire Foam Cutter even more versatile. The Guide can be used to cut precise angles.